On the first warm and sunny day of the year, Washington, D.C., Martin Luther King, Jr. Middle School principal Sharon Riggs needs one more substitute teacher. Victor Kennedy, the father of the school’s secretary, agrees to teach the seventh-grade American-history class for the day and tells the students about the Tuskegee Airmen. During World War II, the Tuskegee Airmen were the first black men allowed into combat, flying over 1,500 missions over the course of the war and winning a significant battle against segregation at home. Young readers will experience for themselves the triumphant pride of these men in serving their country. Partners in the firm of Homan and Reilly Designs, Lynn M. Homan and Thomas Reilly bring extensive experience in historical research, writing, and creative design to their work. They are also co-authors of a book for adults, Black Knights: The Story of the Tuskegee Airmen. 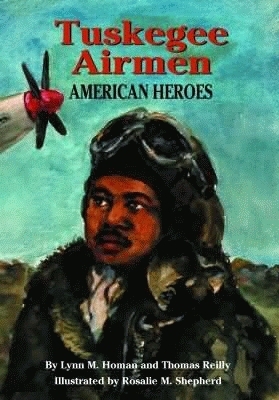 They have also written a picture book for children on the subject, The Tuskegee Airmen Story. Illustrator Rosalie M. Shepherd is a landscape and portrait painter who works with oil, charcoal, and watercolor and has worked extensively as a graphic designer.